Even in the midst of what we are going through, there have been some pretty low points. Some are more so than others. Today was one of them. We woke up to an average every day Monday, getting breakfast, scurrying about to find school books with some Diego thrown in there. I got ready for the day to begin when all of the sudden, Grace was in a panic. She had seen the DTE Energy worker pulling up to the house. I ask you, who needs dogs when you have children who announce at the very minute, even before they are able to get out of their car, when there is a foreigner on our property? The lady informed us she was here to shut the electricity off. Sorry. But that's what she was here to do. No sympathy. No concern. I realize that, that was her job and that a person in her position probably gets a little numb to the fact that people have their sob stories but considering the state of the economy, I guess I was hoping for just a bit of understanding. I realize their was nothing she could do but it's all in the attitude. She said to hurry up and call the main office to see if there was anything they were willing to do considering the fact that we had made a payment this past week but it wasn't enough. However, she didn't wait for five minutes for us to call, she just shut if off. So there went the phone. How are you suppose to make a phone call without electricity?? Thank goodness for cell phones which yes, we still have because we need them to do business. Of course, the answer to our call was that they wanted the past due amount and wouldn't turn it back on till it got paid. The kids were all upset. Aaron was crying telling everyone in the house that everything was broken. It just rips your heart out when you realize that what you are doing is just not sufficient. I was on my way to take my Mom to a doctors appointment so I loaded everyone up in the car to take them with me. Have you sat in the car with five kids for an hour or so? The noise level can get a little overwhelming at times especially when you throw stress in mix. It is much warmer in the car, then the already declining temperature in the house. My poor husband had to bundle up as he needed to stay home and make phone calls. Sometimes, I can't believe that I'm sharing all this personal stuff with you all but I want to share it because I want you to know that God follows through on his promises. He never promises that as Christians that things will be easy or that we will be exempt from hardships. It is so easy to begin wondering why God is allowing all of this stuff to be happening or to question His love when we suffer. I've been there. I've thought those thoughts but I've also learned many things this year through all of this. God never fails to provide. Through God's provision, our electricity was only off for four hours and it is now restored. Thus, me being able to blog about it...lol. I've shed many a tear today some coming more like sobs because I do not like being in this situation which seems to be never ending. I am sure that you all probably get tired of hearing about the nonsense that is going on here but again, again and again, God keeps providing in ways that just blows my mind. His care that He has shown to us through so many wonderful people have just rendered me speechless...again. Sometimes there are just no words that seem appropriate. One of the things that has been impressed upon my heart lately is to share the stories of God's faithfulness. Through those real life stories, we are touched by the heart of God and our faith grows. When God moves in such a way that blows me away, it is hard to keep silent. I want to share how God worked through different situations not because I am trying to boast about it but to give Him the glory. He is on the move, my friends! The thing that totally amazes me is how God is choosing to pour out His love on us. It is not in ways I would have ever imagined or expected. My husband has this friend who he has known for a long time but lost touch with until this past year. He found out about our situation here with our home going into foreclosure and some of our other struggles. Right away, he was on a mission to help us. He has an amazing ability to find deals on Ebay and such. Yesterday, we get a call from him and his wife asking us to guess where he was. He quickly informed us that they had driven across the state to pick up this gigantic TV they were purchasing for us and that they were on their way to our home to drop it off. You about had to pick me up off the floor. We weren't expecting it or even thinking about a TV. It was somewhere on the 'in the distant future' list. However, he had seen our TV and had decided that was something he wanted to bless us with. Not only did they do that but they also wanted to feed us a really big feast to just show us how appreciative they are for friends and for all the work my husband does on his computer. He also wanted to send us home with a smaller TV for the kids room and a Nintendo 64 for them to play games. The gifts that they have poured out on us just blows my mind because I know where they are financially. It was a huge reminder that no matter how much we have, God uses us to bless inspite of it. He uses unsuspecting people to show you His love in tangible ways. In our list of needs, a TV was not at the top of the list but still, God puts things on peoples hearts to just shower his blessings. We wouldn't have ever purchased such a huge TV but God provided an opportunity to just show us that He cares. It's just like my love for Starbucks coffee. It's so not a need and I was even willing to go back to canned Folgers but God has provided fresh Starbucks beans over and over again so that I have only had to drink the other just a couple times. Why? Because He loves us that much. He cares for the little things. Our wants and desires are important to Him too. He fiercely loves us and finds ways to show us that love. I so desire to be used by Him in that way. To be able to show whoever comes across my path, that God loves them so very much. I cannot say this enough. I've known since I gave my heart to Him that He has loved me but it has taken me until this past year to really understand what that means. When that understanding settles in your soul and it's just not a head knowledge kind of thing, no words can properly describe it. Where Do You Get Your Refueling? As I reflect over the past year, there is one thing I know. God has been doing some housekeeping. I've come to realize that as a believer in Christ, He only allows us to stay in one spot for a time and then He moves us forward. He is a progressive God. I know that in my own relationships, if they are not moving forward, they become stale and unproductive. That is not God's desire for us. If I don't care for stale relationships, then why would I expect the One who created our need for them to be satisfied with that either. As a Mom, wife, and business owner, the demands on me are quite grand in size. Sometimes I feel like I am on this hamster wheel that is spinning faster and faster. At some point, I would not totally be surprised to find myself flying through the air with the greatest of ease wondering at what point and where I'm going to land. I say all that to say, that in the past, I've found it difficult to make my time with God a priority. Everything else seemed to take the lead. Let's face it, when there are little people in our faces with their screaming demands, it's hard not to tend to them first. I am not saying that their needs aren't important but there is balance within that. Perhaps, their desire for a second or third cup of chocolate milk could potentially wait for 10 minutes. I heard once that you cannot give what you do not have. And it is true. I've found myself snippy and unsympathetic and all around yell-y when I'm totally drained emotionally. God is the source of all that we have. He is the one we need to go to, to get that refueling. It's like our car, it will not go anywhere if there is no gas in it. I need my time with God to refuel me for the day so that what I require to tend to everybody's needs is there in order to do it. Chocolate does help from time to time and I have used that occasionally for a speed boost. It is definitely not a replacement because nothing can fill us like God can. However, I do consider chocolate a gift from God which is just another example of His creativity and desire to bless us. One of the things that I've had to clean up on is being purposeful in making time for my relationship with God. Being purposeful in not allowing all of life's distractions to change my focus off of God and onto them has been challenging some days. You just never know what life is going to throw from one day to the next. I've found that it has taken some discipline to change some of the ways I've done things in the past. However, the results have been amazing. As I seek God out, He is there waiting to meet with me. I've found that as I've been obedient in that, I have this craving to know more and more. I just can't get enough. And when I turn on the praise and worship music, my soul just longs to be in this place of closeness with the Lord. I am so thankful that my relationship with God has changed this past year and continues to grow. I encourage you to be purposeful in finding that time for God. He has amazing things he wants to reveal to us that can only come when we are connected with Him. One of the things that I am trying to remember when life is throwing us a hurricane is that we have God's peace to rest in. It's very easy to have someone tell you to rest in Jesus but to put it into action is entirely a different thing especially when things are so uncertain. I am so use to running to my panic and fear for comfort which we know does not offer that. God says in John 14: Peace I leave with you, my peace I give unto you: not as the world giveth, give I unto you. Let not your heart be troubled, neither let it be afraid. But how do we get this verse to play out in our lives. I've read that verse so many times but yet, I just couldn't seem to get that full realization to play out in my life. I've found the secret and I want to share it with you. You've got to seek Him, your Abba Father. As you seek Him, He promises to come meet with you. The secret is found in the presence of our Lord. The more time you give Him, the more He can come ALIVE in your life. I have five kids and it is so hard to find time to just meet with God. It is also so hard to find the quietness that I need to actually hear what God is trying to show me. For years, I have used that as my reason for only spending small amounts of time reading and finding out who God really is. Sometimes we excuse it away with it's just this season in my life, maybe later I'll have time, or I'll do it tomorrow and so on. It's unfortunate that we wait until something horrible happens before we pour out ourselves before God. At least, in those moments, many of us seek out our Lord who promises to care for our needs and you know what? He takes it. He takes those moments, no matter how small, with you and He is so excited that you have come to Him. He so desires you to get to know Him intimately. He longs for you to spend time with Him. He patiently waits for you. All He wants to do is for you to seek Him. As you seek Him, He reveals His promises, His word and His blessings to you. What I have found is that the more I seek Him, the more He is able to pour out the things He promises. His comfort and peace and all the things He promises in His word are available to all who are His children but so much more is available to us as we get to know Him better. Earlier this year, I was trying to feel His peace as the waves were threatening to crash down around us but yet, I couldn't seem to get the peace that God promises to settle in my soul. So I asked God, how can I fully grasp onto that and have it as you meant it to be. His answer was to continually seek Him. As He has lead me down this path, I have found a peace I have not known was possible. If you are in this place, I encourage you to jump in with both feet and find out just how much God will reveal to you in response to your openness and willingness to pour yourself into a deep relationship with Him. His love is so amazing and it's directed towards us, His children. When you look at your children on Christmas morning with their eyes so shiny with the love they are experiencing through those special gifts that have so carefully be chosen by you, that same love, only to the ten millionth degree, is what God has for us. He doesn't desire us to be in agony or to be struggling. He does know that sometimes in order to get our attention and to wake us up from our slumbering sleep, it takes something that is scary and agonizing to do so, to recognize our need for Him. So He allows it to happen. His only desire is that we will fall so deeply in love with Him, so much so, that we give up our rights, our control and be willing to submit our will over to the ONE who has so much more for us. I realize this is so hard to do as I struggle with it all the time but it is amazing what happens when you do decide to submit yourself to Him. I pray that even when we are through this storm, this valley, that I will never get complacent in my relationship with Him but that I will let this fire that has been lit in my soul, to never be silent. I pray that my love for my creator would be so captivating that each person that God puts in my path would catch the passion. Some of you may be wondering what is going on. I've had people, my friends, ask. I will tell you as I feel it's public knowledge now and God has removed the feeling to keep quiet. Our house went into foreclosure yesterday, the sheriff sale was at 10:00. We have lost just about everything and I am praying our car is not next but it might be. The thing is this....God is faithful! I've had people tell me they are afraid to read my blog for fear that something else horrible has happened. Please don't feel that way! God...is...faithful! He has shown us in so many ways, ways that are so unimaginable that he loves us. Ways that shout that He is taking care of us as He has promised to do! Even though, this situation seems desperate and scary, God has given us a measure of faith to live it. He has revealed so much to us that all I can do is praise Him, worship Him and give Him glory. I seriously wouldn't want to give up what good has come out of this! I have been awoken from my slumbering sleep. I can no longer say that I do not know of God's love, for He has given me the opportunity to know Him intimately. James 4:8 says, Draw close to God and God will draw close to you. I've read that many times before but have a new understanding of it! When we seek the Lord, He seeks us! He reveals things that He has intended for you that you haven't been able to receive because you weren't ready yet. I'm not talking about material things. I am talking about the joy unspeakable, the uncontainable love that only being close to the Lord God Almighty can reveal. I encourage you to seek His face, dig in, saturate yourself with His word! His word is ALIVE! It is powerful and it reveals who God is! If you want to know Him, you've got to pursue Him. He is standing there waiting for you to come unto Him! He wants to bless you, pour out His glory on you, and to reveal the unimaginable. A couple of my friends think I've lost my mind, but I am praising God for yesterday. Just as it is with God, He is not bound by a piece of paper that has foreclosure written all over it or by what man says. He is the Creator of you and me, He is the one who owns the depths of the earth and the mightiest mountains. He is not bound by the things of this earth....He is the Lord God Almighty! I do not know what God has in store for us but I do know that He has promised to take care of it! I know that he cares deeply about the pain that we are going through and that He is going to return the years taken by the locust. I know that He turns things out for our good and His glory and that He never leaves you in the desert. If I believe, which I do, that God has ordained my life and my steps, then nothing takes Him by surprise and I have to trust Him. I do not like to be in agony and to be wondering why but God knows why and He promises to care for us. I surrender all that I am, I was and ever will be to Him. I feel Him on the move and I cannot wait until He reveals His plan to us. I know that we have been faithful to Him and He will honor that so I can honestly look forward to His care and provision. His word to me today is this: Acts 18:9, Don't be afraid! Speak Out! Don't be silent! For I am with you, and no one will harm you because many people here in this city belong to me! I believe God is stirring up a fire in His children. We must not be silent! I will not be silent. I will continue to give a joyous shout about God's faithfulness, His love, all the things He lays on my heart. His word is full of His beauty, He is ALIVE and as my husband says, He is not a tame lion! Those of you who know me, know that I have a huge bug aversion. I just don't do well with those creepy things. I realize that God has a reason for them and they can be a benefit to our environment BUT should they get into my house, all rules are irrelevant. My shoe is now greeting them intimately with all the love I can muster up unless of course, I can get a kid to save me and then it's their shoe. Yesterday was a beautiful warm Fall day. The kids and I were outside enjoying it when I heard squealing along with Mom, come quick! You got to see this! I walked over to them without realizing what I was walking up to. 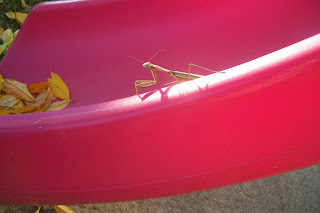 What I found just resting so relaxed on our slide was this HUGE Praying Mantis. I've not seen one that big before. It totally creeped me out! I had the goosebumps the size of Texas and the sense of urgency to R-U-N. I was instructed to get the camera which I did since it was a great excuse for me to get the heck out of there. As I was taking a few shots from different angles because the kids were just not satisfied with a photo from far distances, I noticed that creepy bug was staring at me. What was up with that? I, then, realized him and I were having a stare-down. Have you ever done that before? Well....Mr. P.M. won, he moved and I jumped, letting my eye's drop from his. I wasn't taking any chances of him jumping on me because I think that I would have lost consciousness. Now we move forward to today....another wonderful warm Fall day. The kids were headed out into the backyard to blow bubbles and play in the sandbox when I heard the familiar squeals before they even got outside. I went to check out all the excitement and found myself walking, once again, into my strict no bug rule boundary line being tossed to the wind. There hanging onto the brick of the back of my house was that Praying Mantis who refuses to evict himself from my backyard. Only this time, he decided to tantalize me by hanging out just outside the door so no one could go outside without him flinging himself inside. I looked at that irritatingly huge bug and realized that he was again looking right at me. What is it with this bug? Was there a notice sent out to the local bug population that I was their supreme target? Seriously, I'm not amused. I even walked away and came back and there he was...staring at me. I wonder what he was thinking? If it was me, I'd tell myself that this backyard was NOT where I wanted to be considering the crazy kids that run around and could unknowingly squish me and then there is that bug hating Mother who lives in that house and is NOT afraid to use the can of bug extinguishing spray.....all of it, if need be...on one bug. The kids caught it and removed it from my sight. Of course, not without bringing it into the house to show me. I yelled...'you know, Christmas is coming and it is NOT in your best interest to creep me out with that bug' but I don't think anyone heard me. All I got was laughter. That bug better not show up tomorrow....I heard there is a chance for snow. Muhahaha! We'll just see how he handles that because I am NOT inviting him in and making him hot cocoa. 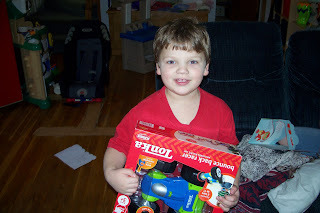 We recently celebrated number four's fifth birthday! 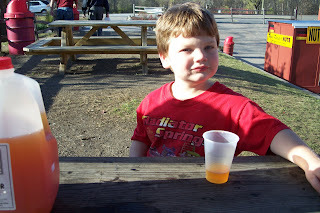 We went to Yate's Cider Mill for some yummy donuts and apple cider which seems to becoming a tradition. How else would you celebrate a Fall birthday?! It is amazing to me how God has created each individual child. As I look at all five of mine, I am blown away at God's creativity. Have you ever just sat in amazement at how your children's mind's each work uniquely and how they grow and develop. Each one is so different, created with different personalities and sensitivities, created to love, dream and grow into what God has in mind. It's like a mystery unfolded before your eye's as God reveals each one. I am so thankful for my five year old. He is such a blessing to those around him, touching them with the compassion he has in his heart. He is quick to apologize and quick to forgive. He tells me how much he loves me sixty times a day. He is all boy and loves to make boy noises that I swear the neighbor's can hear down the street. He is a thinker and comes up with interesting discussions. For example, did you know that putting your nose on the door hurts your nose and that spankings aren't on the top ten list either. So he informed me that he had been thinking about that and was wondering if I would consider putting his fanny on the couch or making him go to his bed for just a little while but not too long?? Like I said....interesting. He, at four, used words like hideous and unfortunate, hysterical and ridiculous. One of my personal favorites was when he asked for a cup of kool-aid that would be an excellent choice for his 'refreshment'. Where does he come up with this stuff?? Now, I do realize that I am his mother and I may be a bit partial. However, I do think he is an amazing gift that God has blessed me with and I don't ever want to take him for granted....along with any of my other children. I look forward to what this new year will bring him, all the learning and new words he'll lay on us. I can't wait for the discussions to continue. He tickles me so. We had an amazing God moment this week. It still bring tears to my eyes when I think of it. God's been really laying it on our hearts to live our lives as servants of Christ. What this means in every day life is to look for opportunities to give of ourselves. One of my favorite quotes is this: Preach the gospel at all times, use words when necessary. Our actions must speak the word of God. One of the areas that I've been praying about is our neighborhood. There are many elderly folks that live here and some that are not but the common thread seems to be that they all keep to themselves....except for one couple. We've only spoken to this couple a few times and it's usually in passing, nothing ever too deep. However, we always see them outside either raking someone's yard, shoveling driveways or giving away vegetables from their garden. They are always giving. My husband wanted to let them know how much we appreciated their example and the things they do to make our neighborhood a community. So he took a jar of our freezer jam and a little note stating our gratitude over to them. It opened up an opportunity to share with them all that God has been doing so faithfully in our lives especially over the past year along with some things that we are currently struggling with. Later that night, they popped over with an amazing amount of groceries that filled our cupboards to overflowing. The thing that blew me away was the fact that they had no idea where we were at in that department and yet the word she left me with was that God was an 'on-time' God. How amazing is that? God keeps providing for our needs in ways that keep rendering me speechless. There just aren't words to describe His faithfulness and His provision. I just keep praising Him for these moments and try to share them with others as it is faith building to those who hear it. Then a couple days later, a letter arrived on our door from that same couple with scripture after scripture of God's faithfulness. It was amazing. Not only did they fill our cupboards but they filled our hearts with encouragement and hope from the only one who can fill that need...our Almighty God, our Abba Father. If you ever thought to yourself, I wish God did those things now. I am here to tell you...He does!!! We have experienced it over and over and over again. We have so many stories of ways that God has provided for our needs. He is a miracle working God. He is always on time and never too late. He does what he promises. Our only responsibility is to trust him and seek His face. He delights in us and we are his children.